**LiveXP admins tries to help users to get the best (not the newest) version of winbuilder.exe for LiveXP. 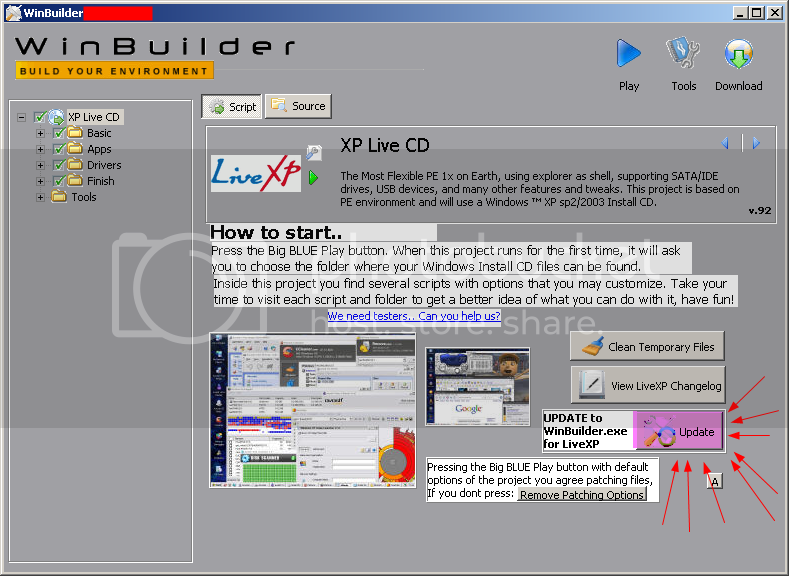 ** LiveXP Project is NOT responsible for any result(s) you get with anyother version of Winbuilder. Winbuilder Development IS NOT backward compatible. 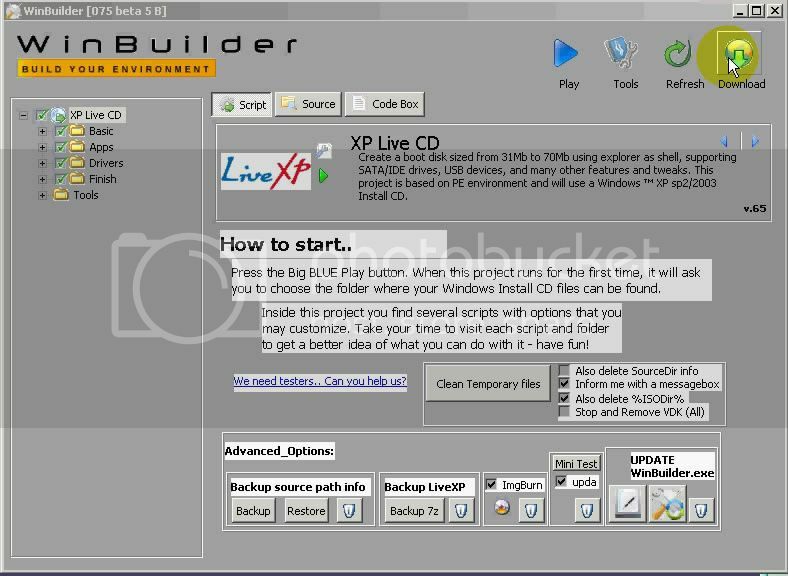 This tutorial and button provided to LiveXP users to get RIGHT version of Winbuilder for the Project. 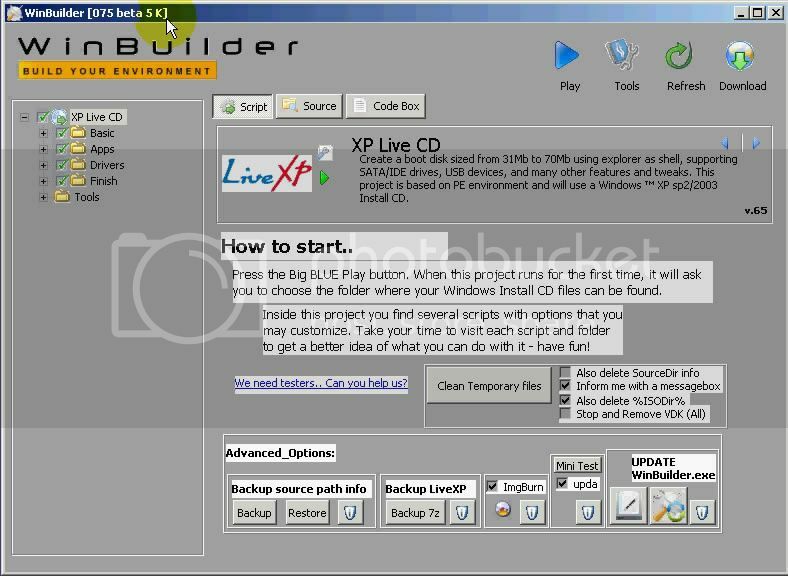 Also project uses new features of Winbuilder. Therefore you MUST use the RIGHT version. As shown in pictures, LiveXP updated from wb075b5B to wb075b5K. Also opposite can be made shown in the movie (ex: wb075b5T to wb075b5K). IMPORTANT: When this tutorial prepared authorised winbuilder.exe version is wb075b5K, it can change in time, just follow the tutorial and dont bother version numbers on tutorial. Edit: When this tutorial prepared, location of the button and main interface was different. Button remained the SAME so tutorial not updated. Here is the new button with new interface for the ones who mixed their mind. Thanks to amalux for reporting which gave me the idea to make a tutorial. How do I get the Advanced Options with Update Button ? I am not sure how name changes, maybe because of language file, but only button name change, every other things are same. Lancelot, if you use a proxy surf service it's possible to bypass any country specific restrictions. All of these should workaround the limitation. I found the Update Button. but is not effective in getting the Update Button. i can access youtube but i cant sign in (with your links and with my proxy changer utilities). I hate my stupid goverment policies like many of citizens around. Because i do not upload movie to youtube (i got my account only for boot-land long time ago) not an essential problem to me, i guess giving direct links for small sized movie files will be enough for this mini tutorial. Don't worry. There are plenty of other alternatives out there and they can't block them all.. Please try them and let me know which one works better for you, then I'll add support for seeing it directly here on the forums. hi all i i waz wondering is there a way to add user to win7 pe?? ?